around the country. Online retailing has squished many. Both proposals should be laughed at by the independent board members. If its funny, I may start listening again. I am having a sabbatical atm. negative (I only know of this from umra). BTMS - Equine Advisor Extraordinaire. If its funny, I may start listening again. over we can ditch that nonsense and get on with the cricket season. Given their ages they are probably glad to have the work! folk seem to need go on cruises and such like. visitors. And probably doing the Rhine from Amsterdam next year. We did a Baltic cruise two years ago, which was wonderful. Particularly looking forward to doing the "Bridge". anyway would prefer to go city-crawling and mingling with natives. But as ever I'm open to having my perceptions corrected. dry land and opportunities to be on your own to see what you want to see. get stuck with some undesirables, you probably won't see them again. went to the shows though, which are probably quite busy. and anyway would prefer to go city-crawling and mingling with natives. board for lunch every day because it was free. Thanks for that. I'll have a look at what Princess has to offer. with benefits. You can do the odd sector, get off and get the train, etc. equivalent of a hotel night but more fun. fisherfolk mercilessly taking the piss. when the daylight disappears in October. Oslo is one of my favourite European cities. 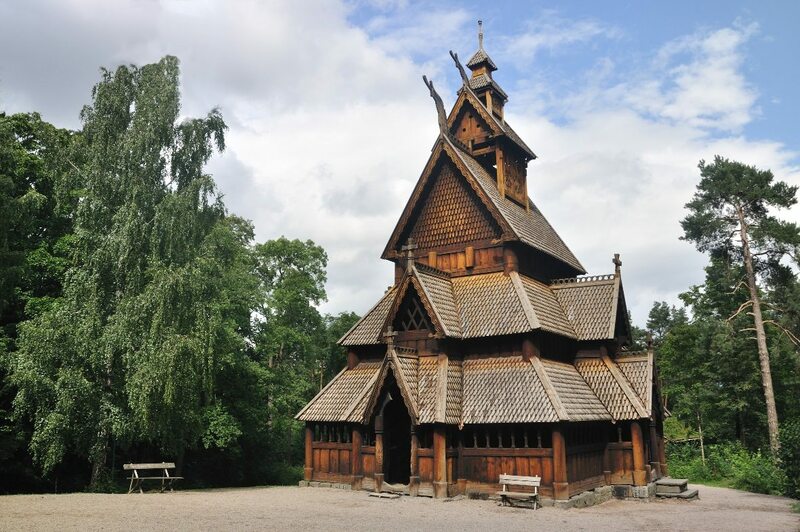 ever step count of 33,000.
this wooden church. The whole thing is made of wood - even the roof tiles. We really enjoyed that too. I regretted not getting to the Opera House. I hated the Vigeland sculpture park, made me feel deeply uncomfortable. unpleasant things to each other. You always thought it was just plain sailing did you? teachers, professors - with whom we had plenty in common. cruises seem to be mostly Brits. many cases withought being in sight of any other passengers. Indeed. It's quite surprising to discover this. water taxis while we walked to the very cheap People Mover. Our experience with Celebrity was ... worrying. and would not have done so if unhappy. YMMV as they say. home and was not happy with the response. can dock very near to the centre of towns. not manage too many aspects of the others. Some passengers went back on board for lunch every day because it was free. interesting shade of pink I have not seen in myself before. But I have been before - in the last century! longer run. Was proper stick when we did that. After dinner too. Nothing, but it did make me smile. that we even took refuge in a McDonald's. It is - so we are taking a repeat visit. So you are getting off the boat? One day - but not the other as we have two days there! Snappy's BF also called Charles? might be going silent for a while. decades ago, with another UMRAt. went and hanged himself (Matthew 27:5). Go, and do thou likewise (Luke 10:37)." As Brian said, there could be a custodial sentence. that would merit some years in prison. be transferred to an Open Prison. prison imo. Cloive, Soozan, Matt, Hellbent......? another from the Horrobin clan, the one who set fire to Ruth's rick. I have put him on my list to ensure he is not missed. Not to mention Alf Grundy. B4 my time; I only know of it through umra. Apologies if attribs are awry - just wanted to snip a bit. Yes, I think he got away with it ^W^W^W off. Forrest was then on remand on a charge of murder). shopping, after he gave then a promise to return. badger. Toby is definitely iffy. has been to jail, it was mentioned in the 2009 Who's Who. Alf Grundy was in prison for years. And nobody's mentioned Jeffrey Archer yet, thank goodness. per the requirements at that time or now? something that would merit some years in prison. same way as working class crime (criminals). punished as per the requirements at that time or now? But if what Brian did was legal at the time? But what will the charge be? If it was 'storing' [fly tipping] it would be post 1990. Could be up to 4 years custodial - but probably a middling fine. a break. Was it their age? Locke’s attentions are what she wants. Phwoar. Bit of a Goa, that Shula, eh? Under BBC (burr, REPETITION!) guidelines, savings must be made, thus, mic. Have you any idea how much it costs to keep a felon (not Fallon) in prison? No no! There must be some other way out of this. will get him off with a caution. A murder before surgery? I thought it was the other way round. were committed today, they would attract much higher sentences. at that time. Changes in the law are very rarely made retrospective. offences were committed today, they would attract much higher sentences. was the law as it stood, when the crime was committed which was applied. Surely the general principle is to apply whichever is the more lenient. the law at the time. Anything else would be unjust. Sounds right. Otoh do I smell a sentencing committee or several? cases it might not be obvious which law applied at the time. Brookfield moving to Scotland or somewhere remote. cantering with lots of (s)nags behind her. hellos and golden handshakes that there is nothing left in TA budget. Therefore the order has gone out - get rid of actors. will peg it shortly after. is stabbed to death in a pub brawl. rehab. It fails, so she goes away again. thereafter. He goes to Stoke Mandeville for lengthy treatment. Would that save enough money? up the sheep (or whatever). Like a modern-day Tom Forrest? Good idea. in that direction has been swallowed by a sink hole.